Is Christmas 2016 the year you are going to tell her how you feel? Shopping for the perfect Christmas gifts this year doesn’t have to be a stressful dash to the end. All you need for a commitment gift is an idea of what your special lady likes and where to find it. Christmas time is the perfect time of year to present your wife, girlfriend or soon-to-be fiance with a commitment gift and your affection. The warmth and brightness of the Christmas season is an enchanting backdrop for you to present theses touching Christmas gifts this holiday season. Not sure where to get started on finding that applause worthy Christmas gift? Jewelryblackhillsgold.com has you covered! The Black Hills Gold’s Silver Rose Cross Necklace is the perfect Christmas gift for the woman of faith in your life. 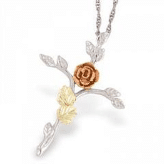 The delicate and intricate pendant of this stunning piece of jewelry is accented with 12k rose and 12k green gold. The pendant measures to 15/16”x 1 ⅜” and it hangs on an 18” sterling silver chain. Black Hills Gold is known for its quality of work and jaw-dropping designs. Whether you are buying it as a commitment gift or not, she will still be awestruck by the craftsmanship and the elegance of the pendant. So if you want to give her a gift that is as beautiful as her, check out the Black Hills Gold Silver Rose Cross Necklace! Is your lady love not a rose gold gal? Is this the Christmas you want to make your relationship official? 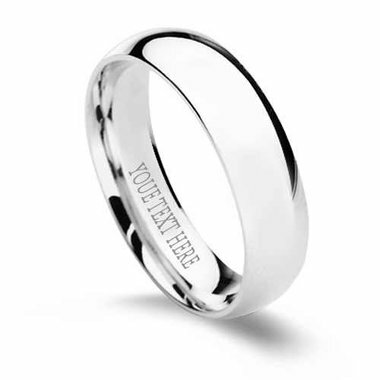 How about checking out forevergifts.com’s Personalized Sterling Silver Promise Ring? This simple and engravable ring will say it all to her this Christmas. The Personalized Sterling Silver Promise Ring is 6mm and polished to a dazzling shine. The ring contains 0.925 sterling silver and is engravable on both sides up to 30 characters! Engraving is always free at forevergifts.com, and the site guarantees 100% satisfaction with their beautiful silver products. It is a personal and intimate gift she will cherish for the rest of your life together. This simple band will be an awesome way to tell her you’re ready for the next step this Christmas! No matter where you are in your current relationship Black Hills Gold and Forever Gifts are two companies who will offer you unique and gorgeous Christmas gifts to show your commitment to that special lady!